My good friend Jon Mobely (aka Jonny Magic) is arriving in Japan this evening for a very busy week of outreach, video production, website consulting and fellowship with his bearded missionary friend (yours truly). We at Grace Church Sapporo are extremely thankful to him for sacrificing his time to come minister with us. We have been handing out flyers all over Sapporo and Iwamizawa cities in preparation. 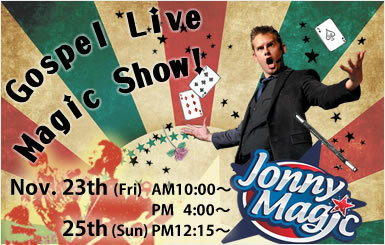 People are very interested in magic so we look forward to seeing Jon use his talent as a means of sharing the gospel. We are very excited to get our foot in the door and Mayah & Malachi`s elementary school. The school administrators were enthusiastic to have him come perform on two different days. While he will not be able to share the gospel at the school, we are inviting them and their families to attend the Friday & Sunday outreaches at Grace Church Sapporo. Will you pray for Jon`s time here in Japan? The need gospel here in Hokkaido Japan is desperate (most of 5.5 million do not know Jesus and have never heard the gospel). Below I have listed out Jon`s busy ministry schedule. Will you commit to pray for him. Will you also commit to pray for the gospel to be proclaimed clearly and that many will begin discovery Bible studies and place their faith in Jesus? Will you support my nephew on Christmas mission trip to Japan?